September 14, 2018 | 7:00 p.m. 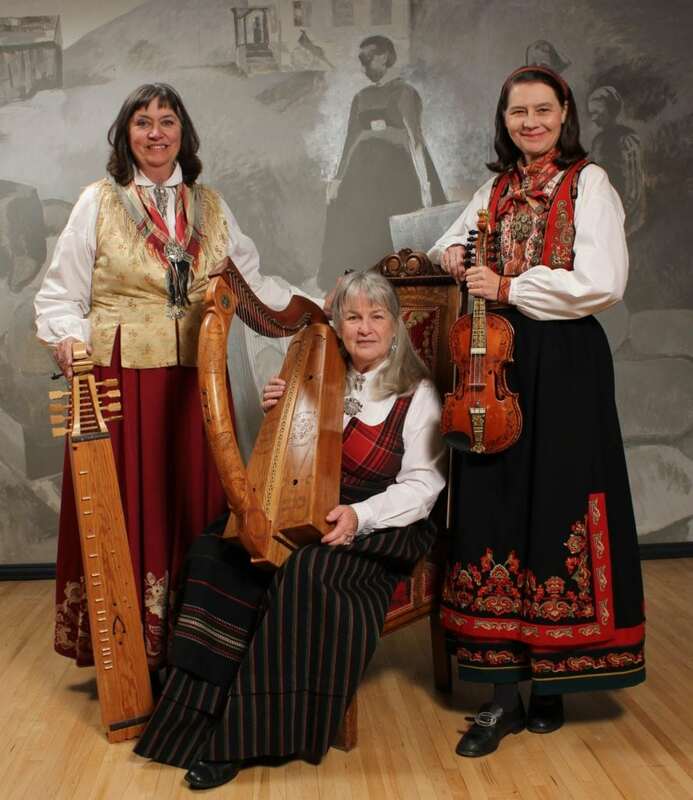 Enjoy a rare opportunity to hear traditional folk music from the region of Telemark Norway, plus ballads of the Middle Ages. This concert, “Treasures Left Behind,” will take place at Vesterheim’s Bethania Church on Mill St., and the cost is $10 at the door. 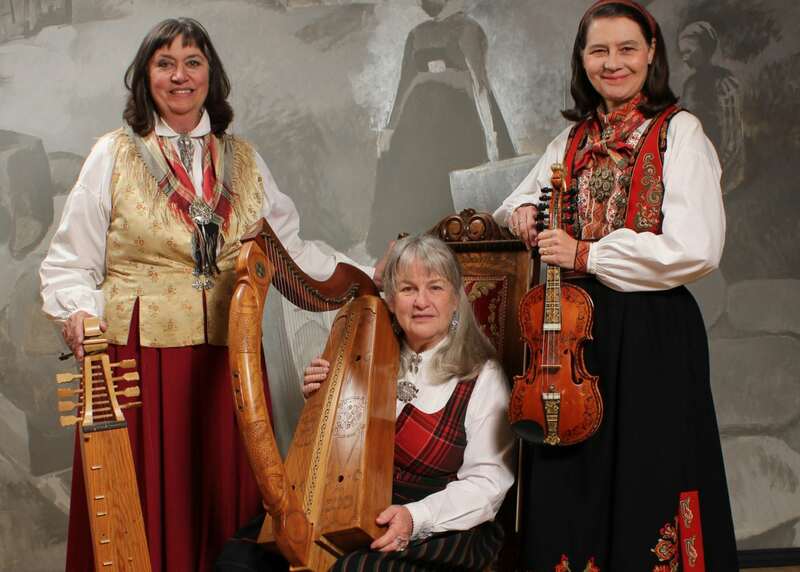 Arna Rennan (voice), Loretta Kelley (hardanger fiddle), and Georganne Hunter (Gaelic harp) will bring music and stories to life during this memorable performance. Arna Rennan immersed herself in “kveding,” the style of traditional folk singing at the Institute of folk culture in Rauland, Norway. There she learned directly from tradition bearers—Ragnhild Furholt, Agnes Buen Garnaas, and Frode Nyholt. She is attracted to strong and unusual melodies and the captivating stories that offer a glimpse into another time and place. She has performed extensively throughout the Midwest at festivals and together with Loretta Kelley in the Washington DC area. She has recorded four CDs—Nordic Shores, Big Brother/ Little Brother 2006, Treasures Left Behind, and Rescued Treasures in 2017. Rennan also hosts a radio program—Nordic Roots Music on KTWH, Two Harbors Community Radio (ktwh.org). Loretta Kelley is among the foremost Hardanger fiddle players in the U.S. Upon meeting Sigbjorn Berhoft Osa, virtuoso Hardanger fiddle player in 1976, she fell passionately in love with the instrument. She studied in Telemark for one year in 1979. Since then she has gone to Norway over 20 times. Loretta has created two largely solo recordings—Dansekveld (1990) and AmerikaSpel (1996). She has collaborated with Andrea Hoag and Charlie Pilzer on Hambo in the Barn (1996) and Hambo in the Snow (2006). Hambo in the Snow was nominated for a 2007 Grammy Award as Best Traditional World Music Album. Kelley also performs and teaches extensively and is currently President of the Hardanger Fiddle Association of America (www.hfaa.org). Georganne Hunter performs with the Gaelic harp and teaches students where she lives on the North Shore of Lake Superior. Both she and her students have won top placements in regional competitions. She has recorded two CDs—Stoney Point and Green Stone. Hunter was a founding member of the Celtic group Willowgreen. She has a strong affinity for both Celtic and Nordic music due to her grandmother from the Shetland Islands.